Enjoy precious uninterrupted time with family and friends while exploring a diverse farming enterprise, soaking up the natural wonders or helping yourself to the seasonal vegetables from the Lodge gardens. Relax to the sounds of bird life on Horseshoe Lake and grazing farm animals, while unwinding on the sheltered deck. 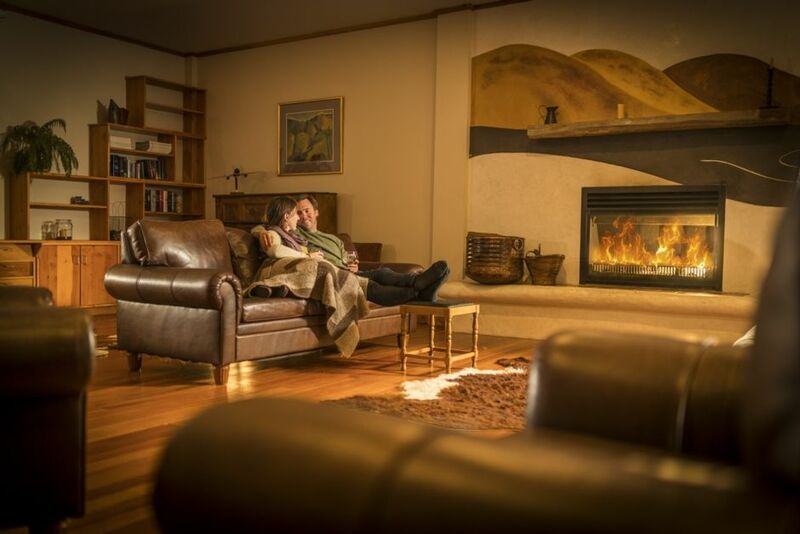 Or snuggle in by the open fire and indulge yourself with a good book while sipping some of Hawkes Bay's best. Witness the breath-taking night sky, kayak on Horseshoe Lake wildlife reserve. Walk or bike the farm tracks and forest trails, join in farm activities or take a guided tour as we tend the animals. Dine on delicious food grown with integrity on The Family Farm. Explore the local beaches, rivers, wineries and restaurants. So much to see and do (or do nothing at all)... no wonder people always want to stay longer.. The Eco Lodge is spacious enough to accommodate 17 people and caters for families and groups. Five bedrooms, each with French doors leading to the expansive deck, provide instant access and views of the spectacular lakeside setting. There are three bathrooms and three showers with tiling that is an artwork in itself. The heart of the building is a light and spacious modern farmhouse kitchen and large luxurious living area with a stunning ‘Tadelakt’ plastered open fireplace. Enjoy the outdoor entertaining area with pizza oven and fire pit. By staying at Mangarara Eco Lodge you help enable families associated with Cranford Hospice, Little Elms, Salvation Army and Womans Refuge Napier some invaluable time out. Mangarara Eco Lodge is your place to relax and reconnect… Expect a friendly welcome. * For single night stays a surcharge of $20 per person applies. lake edge and this being a working farm. Day Hire also available. Perfect setting for group functions. Please phone for more information. Open fire in lounge and radiators throughout bedrooms and lounge. Farm for walking/running and kayaks for the lake. Cleaned and well organized property. Nice nature stay. When you first walk into the house - the view will take your breath away. When you first walk into the house - the view will take your breath away. It is a haven for city dwellers. Beautiful flowers in every room. So much bird life and peace. Greg took the kids around the farm where they fed the animals and even moved stock. The house is set up so well - great quality plates, mugs, glasses, linen - in fact great quality pretty much everything! Would highly recommend this venue as an amazing place to stay. A beautiful lodge set in a beautiful location. A beautiful lodge set in a beautiful location. This was our second stay and we will all be back again next year. This is a great place for friends and family to get together. This is a great place for friends and family to get together. The house has everything you need plus the luxury of amazing views and loads to do. We all thoroughly enjoyed ourselves and I'm sure we will go back again. The lodge was immaculate and suited everyone that stayed. The lodge was immaculate and suited everyone that stayed. Everything was clean and easily accessible. The kids loved going out on the lake in the kayaks and dinghy. The farm tour was great - the girls loved it. It was a new experience for them. We all loved our stay and I'm sure we'll be back!